In the car world we live in today, there are alot of sheep. We all know what I'm talking about...forum after forum, blog after blog you see the same thing. Even we here at RaceFriv do this, you like what you like, you cant help it, but every once and a while you come across something so well built, something so perfect, in a form you didn't even know you liked yet. It's happened to all of us at some point, and it certainly happened to me with this car. Tyler French's blue beauty changed RaceFriv's ideas forever. Read on to see why it should be changing more minds than ours. You'll be star-struck, que the Lady GaGa. Video and pics past the jump!!! See, there once was a time where the Japanese car surge was just starting that Americans were buying cars like crazy, yet in the 70's they didnt really have any good small cars to buy. Honda, Toyota, Nissan and Mitsubishi realized this and starting sending there best and brightest to the states to start gaining market share. Mitsubishi had a problem though, they had a great truck (the future Mighty Max) and the Starion, yet they had very few dealerships in which to distribute them. So they struck a deal with Chrysler to sell the exact same car but under the Chrysler brand to get the cars out in the states. Voila, Diamond Star Motors was born. This is where you get the term "DSM" when you hear people talking about Eclipses, Eagle Talons, early Evos, and even the beloved Dodge Omni GLH. 20 years later enter Tyler French... he's transformed this car from its original form as a red beater and turned it into a blue devil, but I'll stop right there as Tyler can explain his car better than I can. 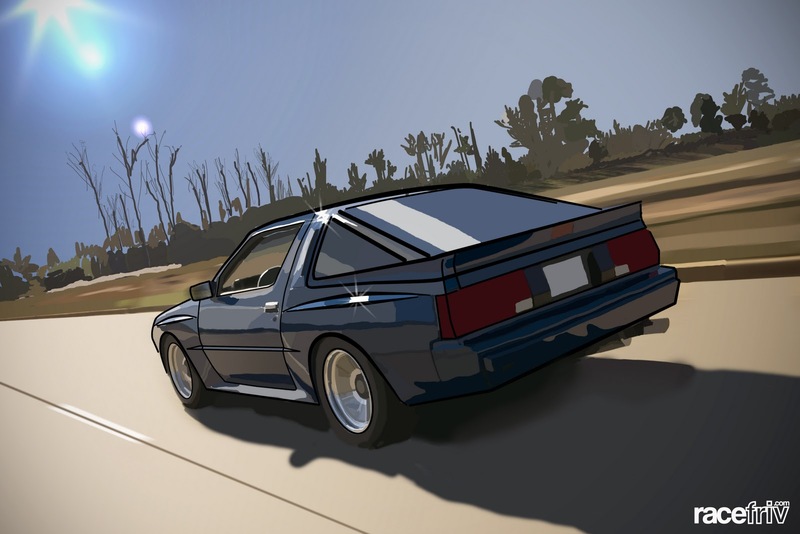 Watch the video below to get the feel of this car and how it will get you scrambling onto Craiglist to find a Starion for sale. Tyler French and his Mitsubishi Starion from racefriv on Vimeo. Just look at that kid, that's the kind of person we like to feature on RaceFriv, guys who are truly into the scene, love what they have and have no problem working on something 'till the job is done. Check out his build thread here. Warning! It will blow your mind, as it is one of the best build threads I've ever gone though. Tyler and his dad built this thing from the ground up. 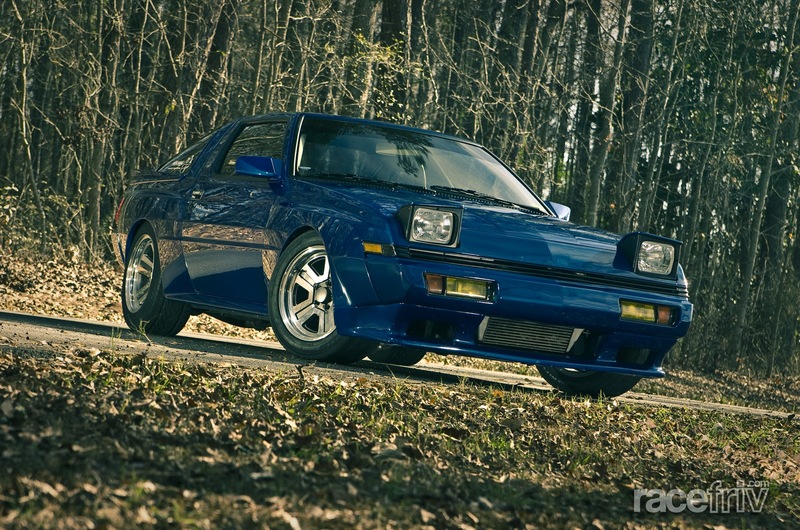 As mentioned before, Tyler's Starion is actually a Chrysler Conquest TSI, he even showed up to a Classic Chrysler show only to almost be turned down by the gate guy saying it was for Chryslers only. Tyler drove away from said show with the top prize. ran into his car there. I really enjoyed his Death Starion sticker and showed it in this post. He found us on Facebook and the rest is history. Yes, it is that easy people! If you have a sick car in the area, just hit us up. I hope through the video and the pics that you got a feel for this rare Stallion (Japanese translation jokingly into Starion). We certainly had fun shooting it and hangin with Tyler with all his hipster antics. Till next time. Thanks to Tyler!!!!!!!! Stay friv everyone!!! 2.6L SOHC inline 4 "g54b"
full 3" exhaust w/ dynomax straight through & divorced downpipe. Polished SHP wheels 16x8" and 9" staggered. 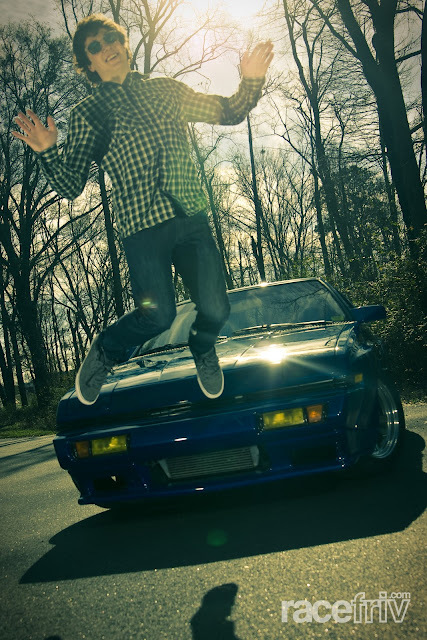 lol @ Tyler...Way to represent the Starion. Nice car dude! Wish I could have been there to meet you! Thanks for the blog friv, and "Frenchi" you the man!